In today’s oversaturated market, your content has to wow your customers. Amazing, customer-focused content is what sets your brand apart from the pack and gets the best results. There’s just one problem – well, make that several million or more, depending on your brand. Each of your customers is unique, and their needs are constantly changing. Today’s sneaker aficionado could be tomorrow’s motorcycle boot collector. As marketers, how can we possibly keep up with their changing needs? That’s where behavioral marketing comes in. Behavioral marketing lets you track your customer’s interactions with your brand – items they added to their shopping cart, categories they browsed on your website, and recent purchases, for example – and use that information to deliver email content that people actually want. Speaking to your customers as individuals is incredibly effective. According to Digital Trends, 73% of people say they prefer to buy from brands that make shopping experiences relevant to them. Many marketers are already elevating their content with behavioral data. In the next few years, 89% of business will compete mainly on customer experience, according to Gartner. Expectations are higher than ever, and delivering those experiences is no longer optional. It is now essential for marketers to embrace behavioral marketing. Using behavioral marketing doesn’t require a total overhaul of your existing email campaigns. It’s quite the opposite! It’s easy to add behavioral elements to your existing emails to make them even more personal and relevant. Here’s how you can do it with your newsletter, promotional email and abandoned cart email. Want to see more examples of behavioral marketing in action with Movable Ink’s behavioral expansion, Stories? Download the Behavioral Marketing Playbook. Looking to test behavioral marketing, but you’re not sure where to begin? Your email newsletter is a great place to start. According to the Direct Marketing Association, 68% of marketers rely on email newsletters to achieve their business goals. Adding behavioral marketing to your newsletter makes your content even more relevant to your customers, resulting in higher engagement. This email example is a newsletter from a sports apparel company that promotes original blog content in addition to product offerings. At the bottom of the newsletter, you’ll see a content block that contains a pair of sneakers that a customer recently browsed. The sneakers are limited edition, so the email also displays live inventory. This is a great example of how easy it is to add a behavioral banner or content block to your existing email newsletter. Newsletters with behavioral content can yield huge results. At Movable Ink, a client who added recently browsed products to their recurring newsletter saw a 488% lift in click-through rates and a 266% lift in conversions per click. The travel and hospitality industry has a unique set of challenges when it comes to marketing, because pricing and inventory are always changing. Customers in search of the best hotel rooms or flights need a way to easily search and book their travel accommodations when they need it most. In this example, we’re automatically pulling a customer’s recent website search right into the email. The email displays all of their recent search criteria, plus a new low rate. They can also continue looking for other flight from their local airport if they choose. 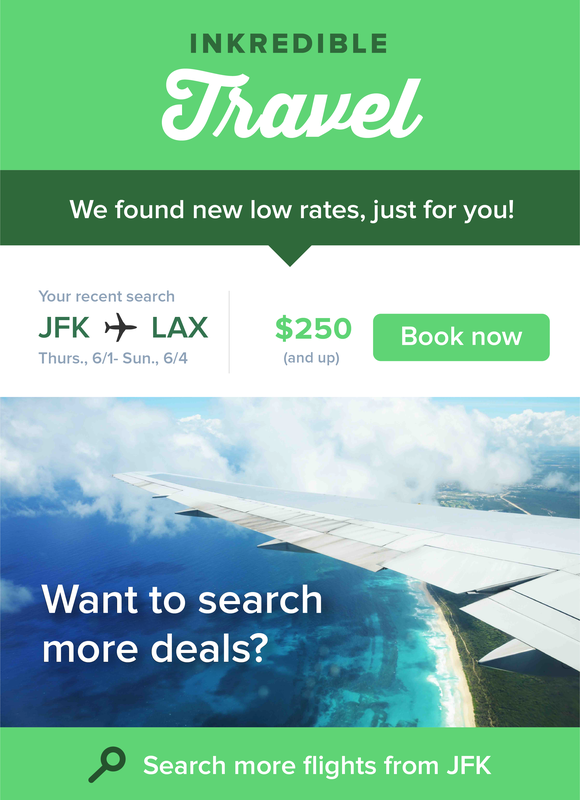 This type of email is super helpful for customers who just need a little nudge to complete their travel purchase. According to Salecycle, shopping cart abandonment emails are opened nearly three times as much as other emails. That’s why they’re so powerful for giving your customers the nudge they need to complete a purchase. This is another great example of how easy it is to add a behavioral content block or banner to an existing promotional email. 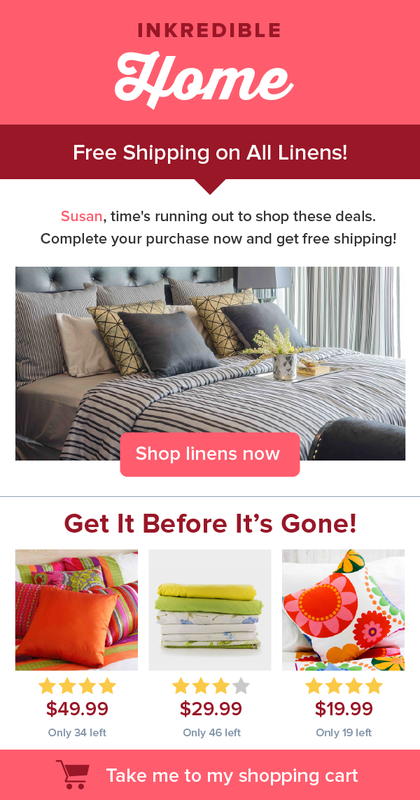 Here, we’ve added a behavioral content block below a promotion for free shipping on linens. The behavioral content block automatically pulls in the three most recent items that a customer added to their cart. The result is a cart abandonment email that yields awesome engagement. One Movable Ink client used this tactic and increased engagement by 50%! Behavioral marketing is a great way to send your customers email content they actually want – and that translates to higher engagement and more sales for you. Use these ideas as inspiration for adding behavioral marketing to your existing email campaigns. Want to learn more about behavioral marketing and find out how Movable Ink can help you leverage your customers’ interactions? Download the Behavioral Marketing Playbook. This entry was posted in Email Marketing and tagged behavioral marketing, stories on May 25, 2017 by Kristen Dunleavy.